Can Maura overcome her perfect image and finally be true to herself and her heart? Here’s To Yesterday was absolutely amazing and completely blew me away in all of the best ways possible! 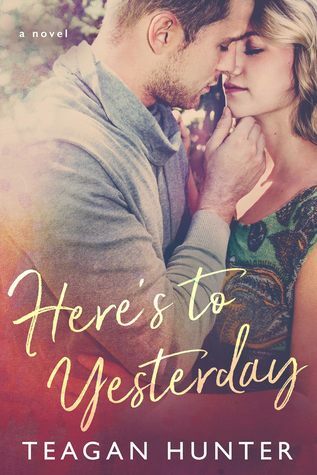 I loved Maura and Tucker’s story with all of my heart, and it was even better than Rae and Hudson’s in Here’s To Tomorrow. And that’s saying a lot, because I loved their story too. Teagan Hunter is a freaking brilliant writer and I am so happy that I discovered her beautiful and highly entertaining words, stories, and characters. I’m actually really upset with myself that I didn’t start reading this amazing series earlier. She did a phenomenal job with Maura and Tucker’s story, and I truly enjoyed reading every single page of it. Maura and Tucker were amazing characters and I immediately fell in love with them and their story. I loved their personalities and chemistry together, and how their relationship progressed throughout. They both dealt with difficult situations and feelings in this book, but all of it was definitely worth it in the end. I loved that Ms. Hunter wrote the book in three parts: the first was told from Maura’s POV, the second from Tucker’s, and the third from both of their alternating points of view. It was amazing to see what each character was thinking and feeling throughout, and it truly made me connect with Maura and Tucker on a deeper level. They were extremely difficult not to like, and I seriously fell head over heels in love with them and their story. I loved everything about Here’s To Yesterday and I honestly wouldn’t change a single thing about it. It was simply perfect and I am so glad that I read it. The secondary characters were once again wonderful and highly entertaining, and I loved getting to see all of the familiar faces from the first book. I loved this tight-knit group of friends so much, and I am extremely excited to read the rest of the books in the Here’s To series. Here’s To Yesterday was truly phenomenal and I couldn’t have asked for a better storyline and characters. Maura and Tucker’s story is definitely one of my top favorites of 2017, and I couldn’t have been more ecstatic with the conclusion. If you haven’t read any of Teagan Hunter’s novels yet, I implore you to do so immediately. You are truly missing out on some of the best stories and characters I have ever read! FIVE “Maura & Tucker” STARS! Thank you so much! Have you read this book or series yet? No i haven’t, gonna go check it out. I hope you enjoy them if you decide to read them! Thank you so much! I haven’t read Here’s To Forever or Here’s To Now yet, but I hope to really soon. I have a few ARCs and other things coming up, so I’ll have to wait until I’m done with those. Only yesteday, did I finish with “We Are Stars”. Have you read that one yet? No, I haven’t. I don’t usually read YA anymore, although I’m pretty sure We Are the Stars is an upper YA, isn’t it? I’ll have to check it out sometime!